Before you import a contact file or key in any new contact, please check whether the built-in data fields fit your need. Click [Admin] at the top right corner of screen. 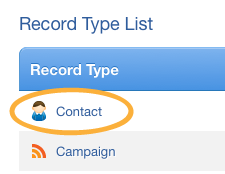 Then select record type [Contact]. Alternatively, you can enter [Contact] section, then click [Set Up Contact Field] at the top right corner. 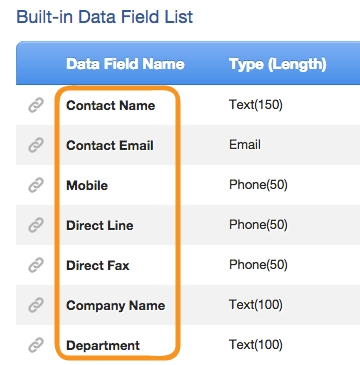 Check whether the built-in data fields fit your need. You can rename data field or edit field options. Rename data field by clicking the [Rename] button. 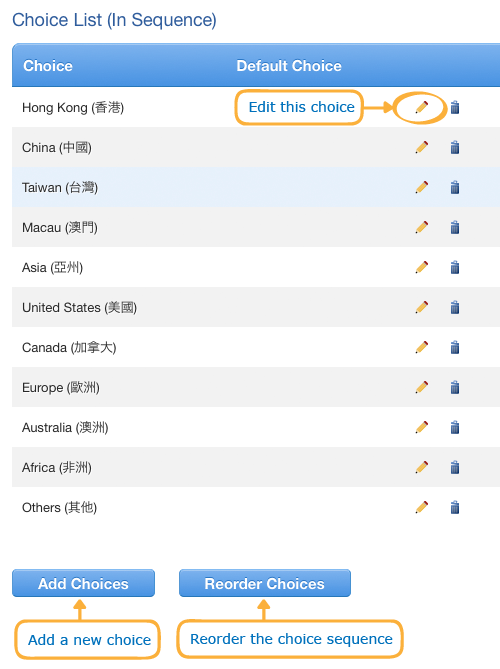 Click the [Edit Choices] button to modify options in [Single Choice] or [Multiple Choices] field. 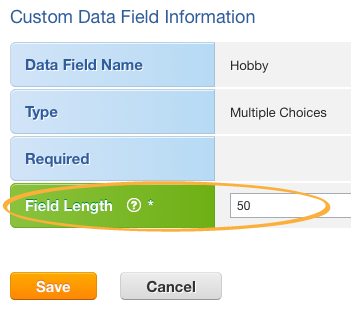 You can disable unnecessary data fields, set fields as required or modify their input sequence. First, click [Edit Data Field Attributes] at the top right hand corner. 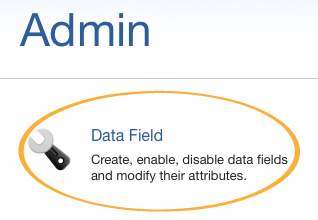 If you want to disable a data field, uncheck its [Enabled] status. If you want to set a data field as required, check its [Required] status. 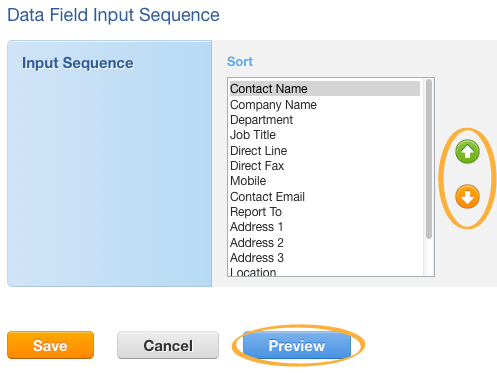 You can reorder input sequence of data fields. When done, you can preview the input form. You can create custom field if you want. Click the [Create Custom Data Field] button under [Custom Data Field List]. 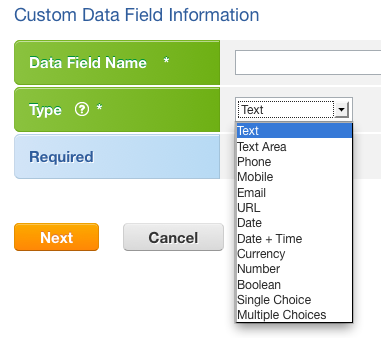 Name your field and choose an appropriate data type. The following data types are available. Define field length by specifying the maximum number of characters/digits allowed. Field length can not be altered once a field is created. 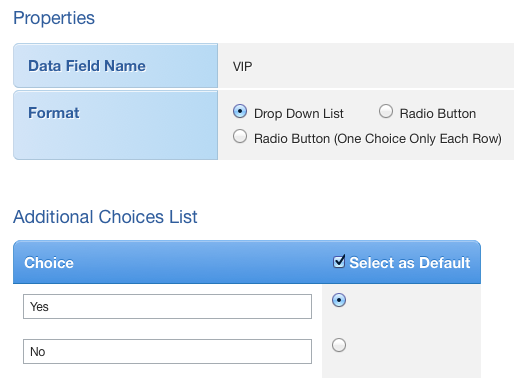 Set up data field choices if you have chosen single choice or multiple choices data type.